We're pretty sure we've figured out the first half of Elon's Musk's "D and something else" tweet. The D stands for "dual" motor, making the Model S all-wheel-drive. But the "something else" has kept us guessing, and as expected, it appears to be some version of auto-pilot. Bloomberg reports that in addition to the P85D Tesla will announce its first stab at automated driving at next week's event in LA, which coincides with Musk's comments yesterday about Teslas being 90 percent capable of autonomous driving next year. The new system will allow the Model S to stay in its lane, similar to those systems on offer by Mercedes-Benz, Infiniti, and other luxury automakers. 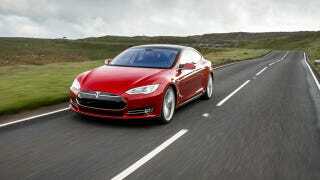 ​Tesla Model S P85D: Is This Elon Musk&apos;s "D"? It's no coincidence that Tesla just started adding front-facing cameras to Model S sedans rolling out of its Fremont, CA plant in the last month. They're integral to the system, along with more advanced radar systems. And with both pre-installed, adding the feature is simply a software update away. Unfortunately for owners that were first in line, Tesla tells us that a "retrofit is not feasible" on earlier cars.